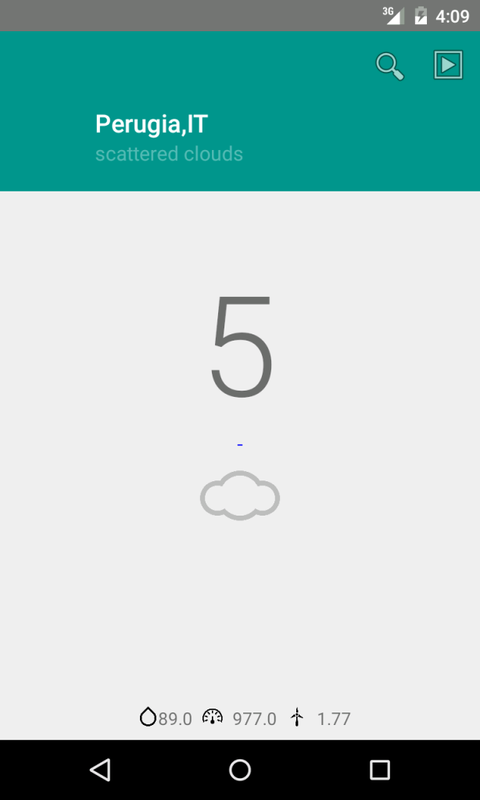 This post describes how to create a material android weather app using material design guidelines. Google Material Design is a set of rules for visual design, UI interaction, motion and so on. These rules help developer when they design and create an Android app. 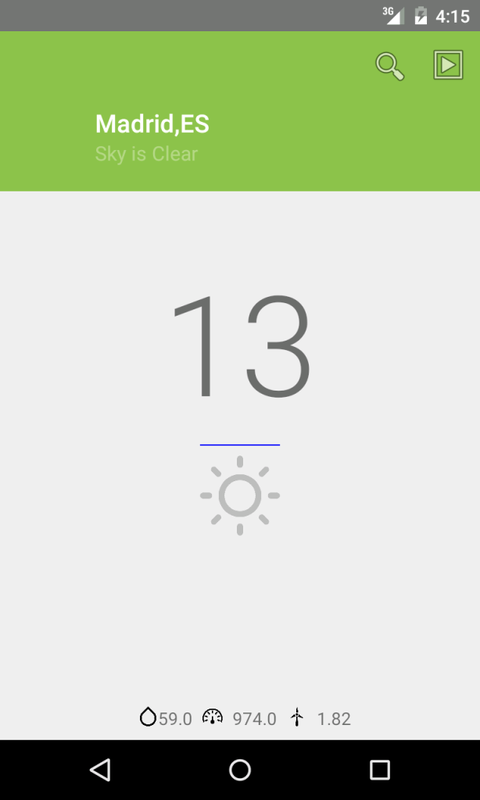 This post describes how we create an Android weather app using Weatherlib as weather layer and Material design rules. We want to develop this app not only for Android 5 Lollipop that supports Material design natively but we want to support the previous version of Android like 4.x KitKat. As you may already know, there are several Android Weather API that provides weather information for free. Using Weatherlib you can make your app working with different weather providers writing your code only one time. For that reason, we will introduce appCompat v7 library that helps us to implement the Material Design even in the previous Android versions. Now we have our project correctly set up, we can start defining our app layout. As briefly explained before, we want to use the Toolbar in our case the extended toolbar. a Toolbar is action bar generalization that gives us more control. Differently from Action bar that is tightly bound to an Actvitiy, a Toolbar can be placed everywhere inside the View hierarchy. Our toolbar background color is set to primary color. You can notice at line 8 we set the toolbar subtitle according to the current weather while at line 15 we change the toolbar color according to the current temperature. As toolbar background color we used the primary colors shown in the guidelines. 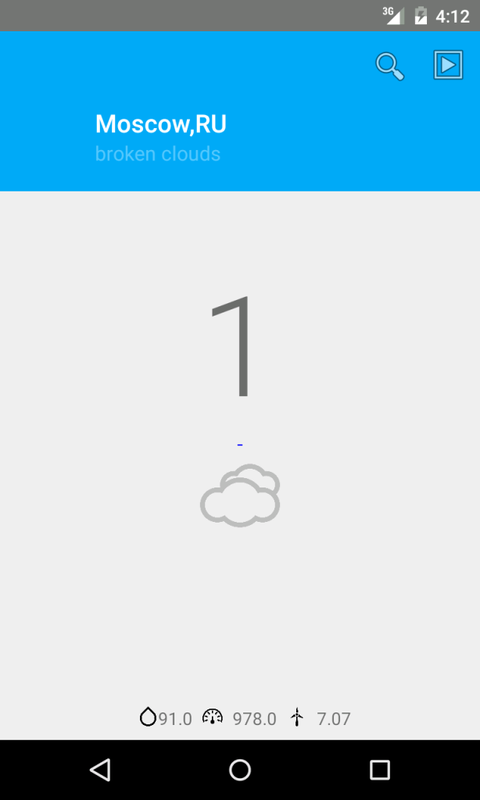 The picture below shows the final result of the android material weather app. Do you know you can build your weather station? It is easy and in the post named Tweets from Arduino temperature and pressure data you can find all the details to build your personal weather station that can monitor your room temperature and pressure and send information via twitter. Give a look. This is interesting isn’t? But….you can create your weather station using Arduino and learn IoT Arduino Programming. Arduino with sensors can measure the atmospheric temperature and pressure. 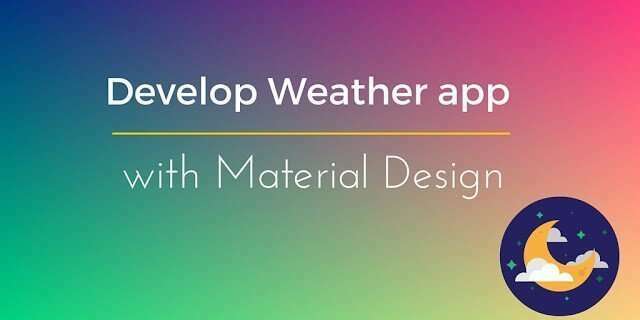 At the end of this post, you gained the knowledge about how to implement android material weather app with a step by step tutorial. You can customize the app and implement it in the way you like. where can I get source code of this app ? maybe you should add padding to the popup window. What is the advantage of ToolBar? Can we just use a simple LinearLayout instead of it? Flexible toolbar and card toolbar from the material guide line? Of course you can use a simple LinearLayout. In this case the Toolbar adds some freedom, because you can add the tile as the City name and the subtitle as the current weather. Anyway you could get the same result using linear layout and adding the menu items to the action bar. A good and clear example. Thanks! Yes but my aim is not to create a production ready app! At the end of the post you can find the link to the source code. The problem is solved modifying style.xml (v21). In this case you have to extend "Theme.AppCompat.Light.NoActionBar" so you won't have the error anymore. You can create otherwise a base theme and extend it in v21 and in previous version (look here https://plus.google.com/+PareshMayani/posts/bFzkHuVvTPS). In github you can find the correct version. Hi! I am newbie to develop…but i try to learn….your examples are very good! 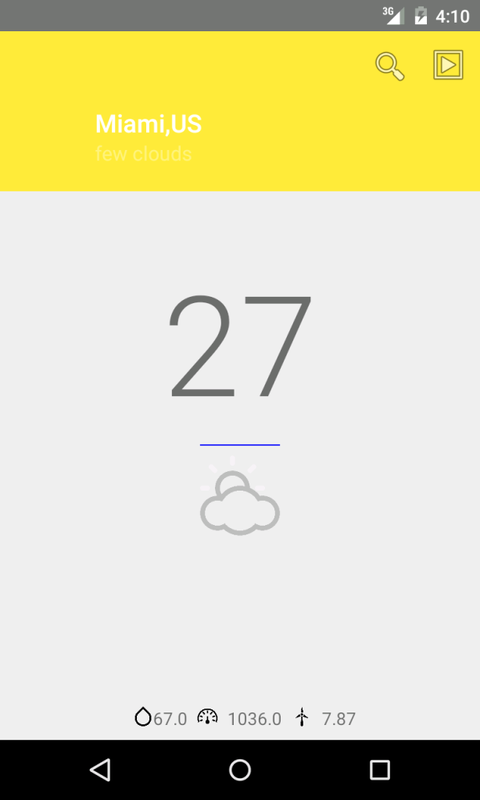 (Material Design + Location api + Search City Bar + Forecast) Weather app! bro, the images are not showing. 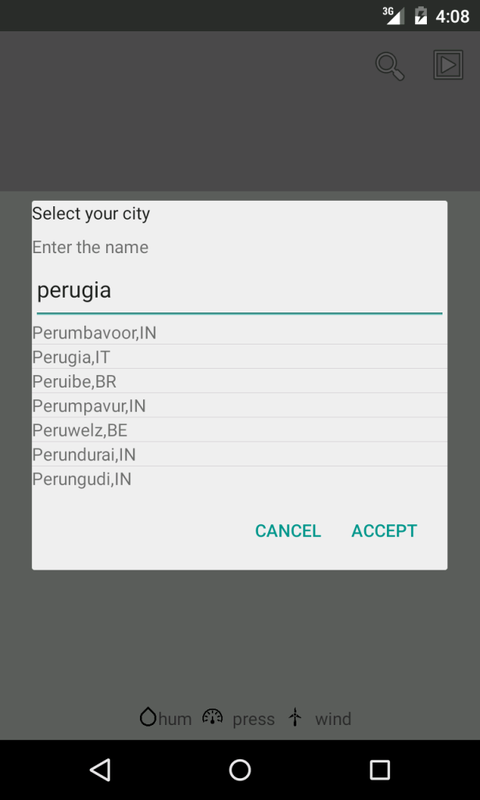 "'void com.survivingwithandroid.weather.lib.WeatherClient.searchCity(java.lang.String, com.survivingwithandroid.weather.lib.WeatherClient$CityEventListener)' on a null object reference"
i want to create Rows within row. how it can be possible..? toolbar.setTitle(currentCity.getName() + "," + currentCity.getCountry());" Keep getting the same error…thank you for your tutorial! I guess the currentCity is null. You should check if this is true and investigate why the object is null. Could it be you are looking for a city that doesn't exist? Let me Know and send to me the city you are using. It could be that the current city is null.. have you checked it? Hi, according to the images this app looks very good. I downloaded your github zip file and I opened materialweather in android studio. I ran across a few errors here and there, but I was able to fix most of them as it was just a few missing files which android studio installed. 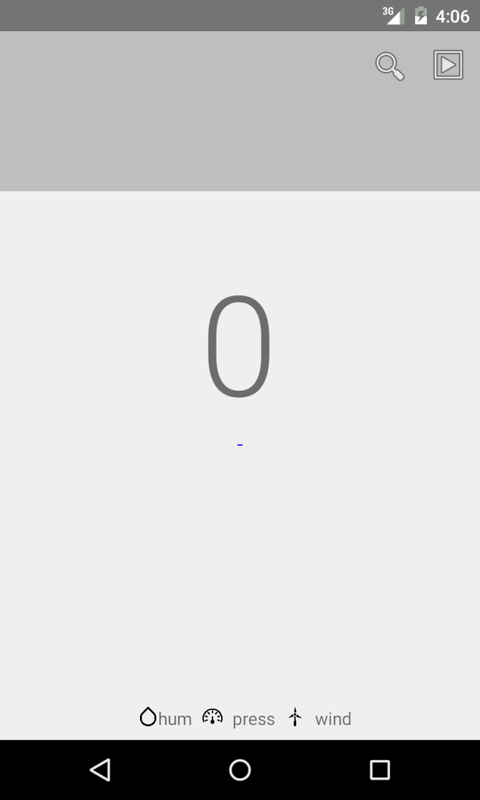 After some time all errors were gone so i decided to run the app on the inbuilt android emulator. The app opened, I clicked on the location entering icon (magnifying glass), entered my city and then the app crashed with this message(Unfortunately MaterialWeather has crashed). Can someone please help me and walk me through to get this app running. If someone has completed this app, then can you please share your github file link below.